Apple has just officially releases the very first Apple Watch OS Firmware Update, as an OTA (Over-the-Air) for Apple Watch (38mm) and Apple Watch (42mm) devices. Apple Watch OS 1.0 Firmware (Build: 12S506) is a modified version of iOS 8.2 Firmware currently running on iPhone, iPad and iPod Touch devices, and just like Apple TV OS that used iOS Firmware as a base and backward compatibility. The official Direct Download Links of Apple Watch Firmware .IPSW Files for 38mm and 42mm Apple Watch devices are available below for users who need to perform manual installation and upgradation process. Apple Watch OS Firmware using "Carousel" as launcher (app drawer) instead of "SpringBoard" launcher, which is currently running on all iOS Firmware powered devices i.e. iPhone, iPad and iPod Touch. Apple Watch Firmware is available in two different builds i.e. 38mm watch and 42mm watch. The Apple Watch 38mm firmware ID'd is Watch1,1, while Apple Watch 42mm firmware ID’d is Watch1,2. 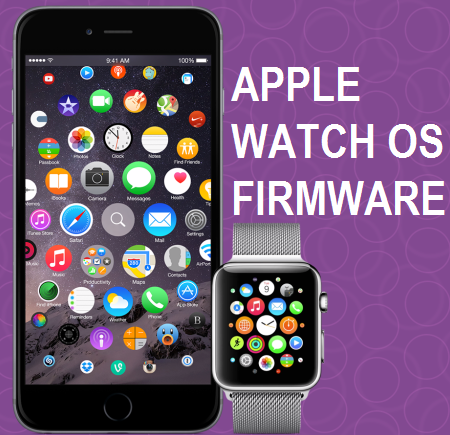 Apple Watch OS Firmware features and functionalities are fully based on iOS 8.2 Firmware and its graphics are powered by PowerVR SGX543 driver. Note: Currently, Apple Watch OS Firmware is only available as OTA (Over-the-Air) delta software (.zip format), whenever Apple posts full .IPSW Files, we will include it below as well.